The following is taken directly from The Town Register Gorham and Buxton 1905 compiled by Mitchell, Daggett, and Bassett. Narragansett No. 1, (Buxton) assigned to Philemon Dane of Ipswich and 119 others Oct. 17, 1733. Town surveyed the same year, and lots not exceeding 20 acres laid out the two following years. 1740- Settlement began about this time. 1743- Garrison house erected at Salmon Falls on account of Indian troubles. First meeting house erected. 1754- Fort erected at Pleasant Point. 1761- Old burying-ground on the meeting-house lot conveyed to the plantation by Isaac Hancock. First public school opened. 1764- Effort made to have the town incorporated. 1772- Act incorporating Buxton, the seventh town in Maine, passed July 17. First election held in Meeting house May 24, 1773. 1785- Great freshet destroyed by mills and bridges. 1792- 335 Polls intown over age of sixteen. 1795- First mills built at Moderation Falls. 1872- Centennial celebration held in town. Dea. Amos Chase of Newbury, Nathan Whitney, Joseph Simpson, Mr. Bryant and a Thomas Gage are believed to have settled within the town as early as 1740 or 1741. Robert Brooks, Magnes Redlon, John Davis, Sr., Nathaniel Durel, John Brooks, James Sands, Jr., Joseph Woodman, Nathan Whitney, Samuel Ingalls, Samuel chase and Ichobod Austin were settlers here in May, 1742. Benj. Durell, David Martin, Benj. Dunnell, Samuel Rolfe. Wm Hancock, John Elden, Job Roberts, Joshua Woodman, John Wilson, Samuel Merrill, and Timothy Haselton, settled prior to Aug. 1753. by 1761, John Boynton, Eleazer Kimball, Jona Clay, Humphry Atkinson, Stephen Safford, John Cole and Richard Clay had become residents and proprietors of the town. Rev. Paul Coffin settled minister, 1761. First Congregational Church-Bar Mills. Organized March 16, 1763. First Meeting house was erected at Salmon Falls in 1742. First framed church built nearly on location of present edifice, in 1761. Replaced by present one 1822. Remodeled and rededicated 1885, also in 1904. Paul Coffin, 1761-1821; Levi Loring, 1817-1835; Benjamin Rice, 1835-1842; Silas Baker, 1843-1845; Stephen Merrill, 1846; Joseph Barlett, 1847-1867; Chas. H. Gates, 1868-1871; Solomon Bixby, 1871-1875; Joseph Kyte 1875-1879; T. M. Davies, 1880-1881; Wm. A. Merrill, 1881-1882; H. E. Robinson, 1882-1884; George W. Johnson, 1885-1889; George B. Trafton, 1890-1891; Chas. H. Gates, 1892-1896; Frank H. Baker, 1897-1901; Chas. P. Cleaves, 1901-1903; W. Henry McBride, 1903-1905. Present Membership 46. North Congregational Church, --Groveville. Organized an independent society from the First Church, Sept. 23, 1852. Church edifice erected in 1820 by citizens and ministered to as a branch of the first church. Steeple added 1857. House raised, repaired and re-dedicated in 1889, and bell added. Geo. W. Cressy, 1852-1867, C. C. Parker, D. D., 1867-1868; Joseph Smith, 1868-1872; S. S. Drake, 1872-1873; Solomon Bixby, 1873-1875; Joseph Kyte, 1875-1879; T. M. Davies, 1879-1881; W. A. Merrill, 1881-1883; E. E. Palmer, 1884-1885; R. S. Duston, (F. Bap. ), 1886-1887; J. S. Cogswell, 1888-1889; Cecil Deane, (F. Bap. ), 1891-1892; Frank C. Bradeen, 1893-1897; Frank H. Baker, 1897-1901; Chas. P. Cleaves, 1901-1903; W. Henry McBride, 1903-1905. Present membership 39. 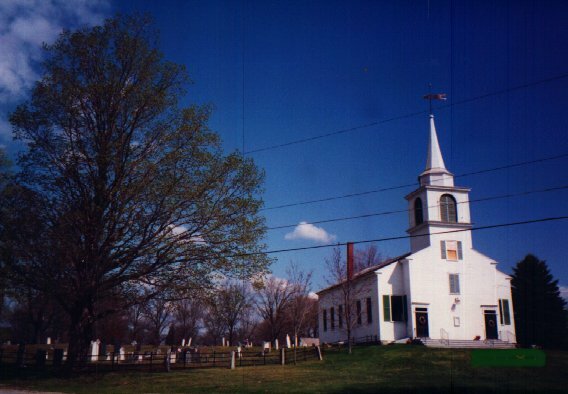 Church organized 1799 as the Baptist Church of Buxton and Saco. Abner Flanders, pastor until 1825 at Buxton Center and Saco. The North Society formed 1825. Mr. Flanders continued pastor until 1829. Meeting house erected 1799-1800, rebuilt 1831. Pastors: Rev. Mr. Flanders, Revs. Wm. Bailey, 1840-44; H. B. Gower, 1848-49; N. W. Williams, 1850; Ivory M. Thompson, 1852-59; G. E. tucker, 1859-62; H. B. Marshall, 1862; O. Richardson, 1865; J. M. Burt, 1881-90; B. F. Turner, 1890-95; Wm. Clement, 1896-1902; E. E. Longley, Sept 1903 to present time. Present membership about 130. Rev. Jesse Lee of Virginia introduced Methodism here in 1793. Class formed 1799. Hugh Moored leader. Meeting house erected 1802, rebuilt 1848. Became a station 1847. Same pastors as Gorham North Street Church since 1879, which see. First society organized about 1795 at Bog Mill. Society divided for convenience in 1834, the "First Society" locating at West Buxton, the "Second Society" at Groveville. First meeting house erected 1833-34. Repaired and rededicated 1898. Pastors since 1878: - Revs. F. K. Chase 1878-79; J. M. Pease, 1880-82; B. A. Sherwood, 1882-85; J. Q. Adams, 1886-89; John Pettengill, 1889-92; J. D. Waldron, 1893-95; Geo. A. Downing, 1896-98; Frank Willcock, 1898-1900; F. D. Tasker, 1900-03; J. M. Williams, 1904-05. Organized April 8, 1834. Meeting house erected 1839. Moved across road and steeple added 1857. Sixtieth anniversary observed April 8, 1894. Pastors:- Revs. J. Clay, 1834-49; J. Crockett, 1850-52; Josiah Keen, 1853-54; Geo. W. Whitney, 1855-56; I. R. Cook, 1856-58; Oliver Butler, 1859-61; Chas. Bean, 1861-62; I. M. Bedell, 1863-66; A. G. Hill, 1867-70; Wm. J. Twort, 1871-74; Wm. T. Smith, 1875-78; T. F. Millett, 1878-79; Otis F. Russell, 1880-82; Edw. S. Palmer (Cong'l,) 1884-86; Robt. L. Duston, 1886-88; Jos. S. Cogswell (Cong'l,) 1888-90; Cecil Deane, (student) 1890-92; Joseph Whitney, 1893-95; A. G. HIll, 1896-98; E. Judson Hatch, 1898-99; H. H. Hathaway, 1900-03; Chas. E. Davis, 1903-05; Present membership 26. Church organized 1868 with seven members, in Church near Dea. Milliken's. Church removed to present site in 1872. Present membership 16. Pastors: -- Revs. M. T. Smith, Perkins Smith, Rev. Mr.s Brooks, Abraham Milliken, John Pettengill, and since 1896 the same as the Groveville Church. House erected as a free church. H. K. Bradbury was early Universalist pastor. Other pastors have been Rev. James Sawyer, Rev. Mr. Hammond, Rev. Mr. Webber, H. H. Hoyt, 1891-92; G. E. Leighton, 1893; M. C. Ward, 1894-95; Dwight A. Ball, 1896; T. B. Paine, 1897: Chas. E. Petty, 1898; Willis A. Moore, 1899-1900; Wallace Hatch, 1901. Church now closed. Organized summer 1895, Merrill C. Ward pastor. Dwight A. Ball, 1896; J. C. Dickerson, 1897. Church dedicated Nov. 15, 1897. Preaching has been maintained only during summer months by Tufts College Students. C. E. Petty, 1898; W. A. Moore, 1899-1900; Wallace Hatch, 1901. 1850-53, A. W. Hanson; 1854, Wm. M. Jordan; 1855, A. H. Wilkins; 1856, W. M. Jordan; 1857, A. H. Wilkins; 1858-60, W. M. Jordan; 1861-62, Robert Wentworth; 1863, A. K. P. Meserve; 1864, R. Wentworth; 1865, A. K. P. Meserve; 1866-67, F. J. Cole; 1868, Joseph Davis; 1869, A. K. P. Meserve; 1870, S. S Milliken; 1871-72, R. W. Murch; 1873, A. T. Hill; 1880-94, Robert A. Bradbury; 1895, Spencer Boyden; 1896-97, H. F. Partiridge; 1898-99, W. T. Jordan; 1900-03, Supply Dean; 1904, Wm. T. Jordan; 1905, Geo. E. Smith.